This picture has been created by Donna Sonnenberg aka North whose blog exemplifies what a wonderful artist she is. If anything, one looks forward to a year where realistic goals are met, to pave the path for those more ambitious. Disappontments to be interpreted as challenges, and obstacles as a pointer to an alternate direction. One hopes there will be a lot more posts ‘In Praise’ than those written in the category of ‘this gets to me’. To achieve that one wishes for Media to focus on stories which uplift our senses, validate the goodness of humans, in equal measure if not more..God knows just how urgent is the need of Heroes and role models in our society today. Going by the pledge to realistic ambitions, one is not aspiring for Utopia to prevail, but it would be wonderful to feel peace, security, absence of fear, camaraderie for all. It is fear which initiates violence. Loss of faith in ourselves and others, is the most unsurmountable loss of all. It is all about this faith which leads to Peace. Peace precludes inner strength. Wish you the same n much more..Achievable goals..oh yes I needed that! I dont believe this ..i have this bhajan in my car and its an absolute must on those weird days …it really works for me..in fact for my whole family.Moms like so sold on it she almost takes off her slippers while listening to it! !..no kidding. And a very hap hap happy new year…this was my version to being original. Dear Kaveetaa, what a pleasant surprise it was, to see my picture at Sachiniti!! 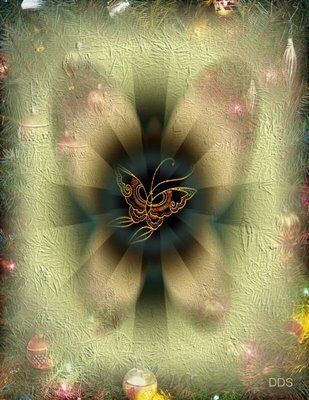 Thankyou for the accolade… I see you went through my norths designs albums on my blog.. and found one of my favorites–a butterfly christmas…. Wishing you and all visitors to Sachiniti; a wonderfully blessed new year; and may each of you, have wishes and dreams come true!! I’ve only just about surfaced! !its been a mad hectic sozzled new years.so lets hope for a great year ahead n lots of more good news! North..yes I sneaked in to your albums…I left a comment on your blog about the same… these are lovely designs.I wanted to showcase your work here.